What’s the best compact spotting scope for you? In today’s rifle scope market, manufacturers tend to focus on variety, novelty and economy for most of their product line, prioritizing quality only for their high end products. This means that the average consumer doesn’t get the best they can offer, and suffers when their scope breaks down unexpectedly. This problem is complicated further because of the stingy warranties offered by these manufacturers. Vortex is one manufacturer that breaks the norm by not only providing exceptional quality across their incredibly diverse line of rifle scopes, but also backing it with an excellent warranty policy that actually gives their customers peace of mind. 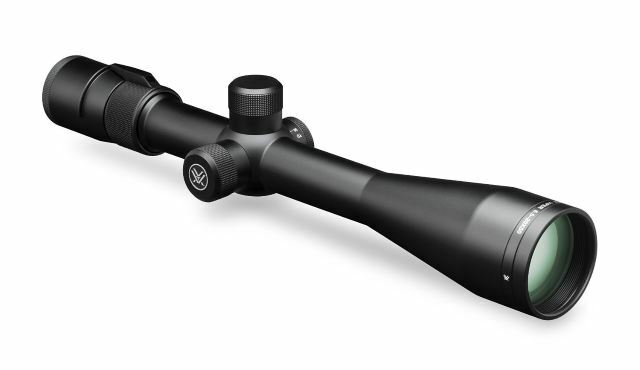 Read on to find out more about this manufacturer’s rifle scopes in this guide – I’ve also added some top Vortex scope reviews for their particularly popular offerings. 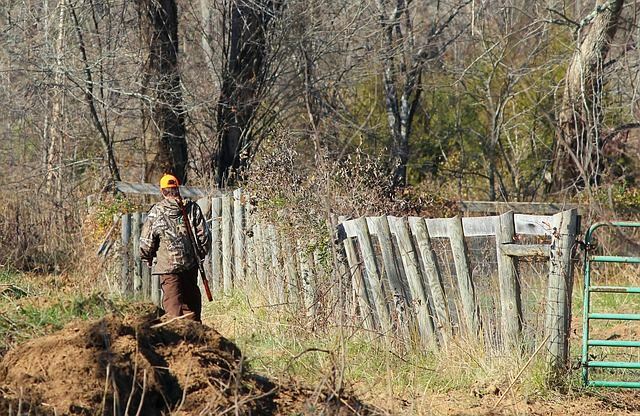 All of their products have been designed to meet stringent quality standards, and are held in great regard by hunters and competition shooters the world over. All Vortex scopes utilize fu﻿lly multi-coated lenses to minimize light reflection at air-to-glass boundaries, ensuring a crisp image quality regardless of lighting conditions. With magnification options ranging from as low as 2x to as high as 60x for their various product categories, Vortex offers you a healthy selection of scopes for all kinds of rifles including muzzleloaders, rimfires, hog hunters and modern ARs. The manufacturer expressly uses aircraft grade aluminum for the construction of its scope’s bodies, even the cheapest of which are built around a single-piece main tube, to ensure maximum structural integrity while also keeping the finished product lightweight. It is worth mentioning here that most of Vortex’s competition do not employ single-piece main tubes for their cheaper products, which makes them considerably less durable. The scopes are designed to be rugged and shockproof, so you can use them in rough field conditions without concern, and they have a hard anodized matte black finish to minimize reflection that could potentially give away your position on a hunt. The entire body is also O-ring sealed and purged with Argon or Nitrogen gas to ensure fog- and waterproofing. 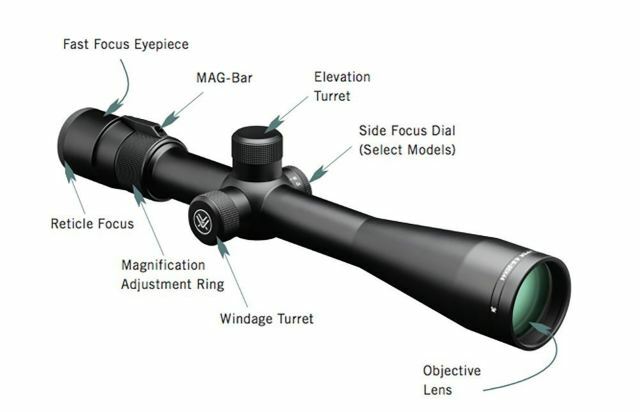 A fast focus eyepiece for swift, simplified reticle focusing is present in all scopes from Vortex, and they claim that it provides 4 inches of eye-relief. However, based on user reviews, a range of 2-3 inches is closer to the truth. This is one of the few aspects in which their scopes disappoint, given how most competitors practically guarantee a 3.5+’’ eye clearance even for their cheapest scopes. All riflescopes from this manufacturer come with a VIP warranty in which the manufacturer expressly promises to repair / replace your scope free of charge, if it gets damaged or if you discover a fault in it, without asking any questions as to how the fault / damage came about. This unlimited, completely transferable, warranty alone makes them stand tall among the industry, where the standard is a limited lifetime warranty. Budget rifle scope series like Diamondback, Crossfire II and Copperhead obviously come with a lot less premium features as compared to the big shots, but thanks to the incredible build quality intrinsic to all Nikon products, they provide surprisingly generous price-to-quality ratios. The reset turrets featured in all but the most expensive scopes from this producer are capped for protection. They allow you to re-index the turret back to zero once you’ve sighted in with the scope. These controls aren’t as intuitive as the ones found in pricier offerings, but are functional in all regards. The mainstream and budget riflescopes from Vortex are normally available in simple V-Plex (duplex), tactical Dead-Hold BDC and/or military favored Mil-Dot reticle styles – which are pretty much staples among today’s rifle shooters. Another reticle that comes with most mainstream Vortex scopes is the V-Brite Illuminated Reticle, which uses an electronic light to illuminate the central dot for improved aiming in dimly lit conditions. There aren’t many manufacturers that will give you this degree of freedom in choosing your scope’s reticle in their budget range. A second focal plane reticle means that the subtensions are pre-calculated to a specific zoom value – which is somewhere between the minimum and maximum values, or the maximum value itself. While it’s true that recalculating subtensions can be a chore, you can’t complain since the alternative – a first focal plane reticle – is a very expensive feature that is simply impossible to incorporate into budget / mainstream products. This process aligns every part of the lens to perfection to give a flawless image result. An apochromatic objective lens mechanism utilizes lenses matched by index for color correction throughout the visible spectrum. High quality lens coatings, developed in-house, are used on these scopes to minimize light reflection and maximize image brightness. Extra-low dispersion glass is used for making the lenses, so you get the crispest, most accurate image of the target that is possible. The outer lenses have an ArmorTek coating to shield them from oil, dirt and scratches, which maximizes the lifetime of the product. High end scope reticles are illuminated to facilitate aiming in dimly lit scenarios, and this illumination is adjustable through a side knob. This feature enables the manufacturer to produce the sophisticated reticle designs found on their premium scopes. The reticle is shielded from damage by encasing between two glass layers. The EBR reticles (present on Razor HD AMG, Razor HD Gen II, Razor HD and Viper PST lines) are hash marked for windage, holdover and ranging compensations, and some of the scopes bearing them come in two further variants based on MOA / MRAD graduations. The HSR-4and G4 BDC reticles developed expressly for Razor HD LH scopes present a clean look while also allowing for long range bullet drop compensation. The XLR reticle (found on the Viper HS LR line) is geared towards the long range shooter who wants the ability to compensate for windage and bullet drop, but without an extra-detailed design getting in their way. The VMR reticle (incorporated in the Viper HS T series) makes things even simpler than the XLR, by doing away with the explicit dot markings for wind compensation that can be bothersome for quite a few hunters. It will appeal to the traditional hunter in you thanks to the thick posts leading into the crosshair. 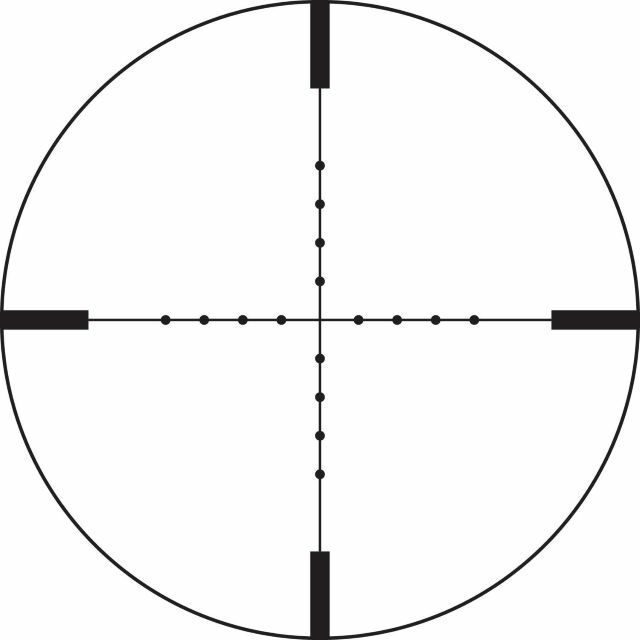 The ECR (enhanced crosshair reticle) and SCR (simple crosshair reticle), found on the Golden Eagle HD scope, are geared towards hunting purists: the former provides minimalistic markings for holdover and windage correction, and the latter is a plain crosshair with no compensation markings whatsoever. 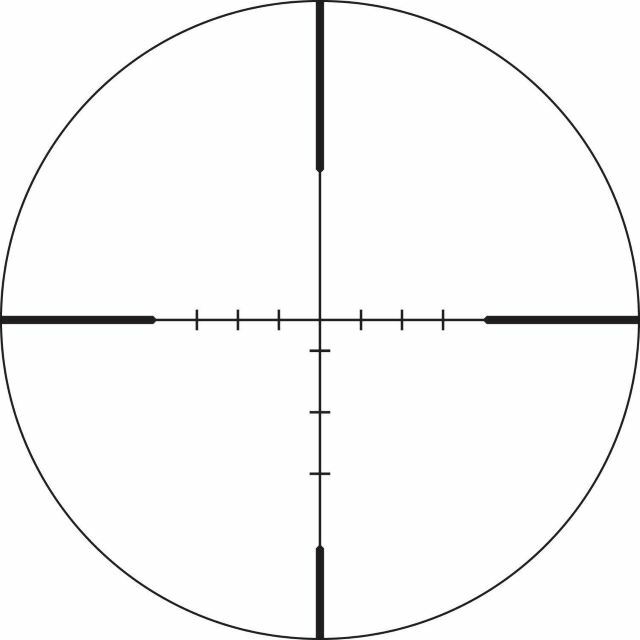 If you are not happy with the number of wind compensation dots present on EBR and XLR reticle scopes (I agree that they can be a bit distracting), you can go for the VMR-1 reticle found in the Viper HS T line of scopes – this one is only hash-marked along the stadia, and resembles a traditional duplex more closely. All high-end, and most mid-range products from the manufacturer pack first focal plane reticles that change size as the magnification power changes, which means their subtensions hold universally, rather than being fixed to a single zoom setting (as is the case with second focal plane reticles). This eliminates the need to calculate new subtension values in the field each time you change the mag. setting, allowing you to devote time to identifying and sighting in the target instead of worrying about pesky mental calculations. The turret screws are precisely fabricated using a silicon/brass alloy, and a dry-film lubricant is applied to them to yield extra-smooth adjustments. Many higher priced offerings from this manufacturer utilize tactical turrets which are marked in a manner that is more visible to the operator in the field, allowing you to make adjustments with greater ease and precision. The most expensive offerings also incorporate an L-Tec system for locking the adjustment controls after they’ve been set, to minimize accidental changes to the settings that could be disastrous for you in situations where you’ve got to make a single shot count. If you’re a marksman who values precision to an obsessive degree (I know I am! ), you’ll greatly appreciate this feature: it lets you fine tune your zero setting even between clicks, ensuring as a good a shot as it can get. This feature lets you setup a fixed zero reference point using a series of shims place on the elevation turret, so you can quickly reset to zero after having temporarily adjusted the elevation setting for your shot. A hardened, heat-treated steel pad is placed at the tip of the turret screw. This steel pad interfaces with a steel ring present on the erector tube to minimize friction that can lead to deformation or galling of the erector screw contact point. Besides enhancing durability, this also means you’ll get more repeatable results, as compared to other products. Combining the excellent features of its cousins, Viper HS and Viper PST, the Viper Hunting Shooting Tactical 6-24x50mm scope is intended to be a versatile sighting utility for both tactical enthusiasts and hunters, using firearms ranging from ARs to bolt guns. 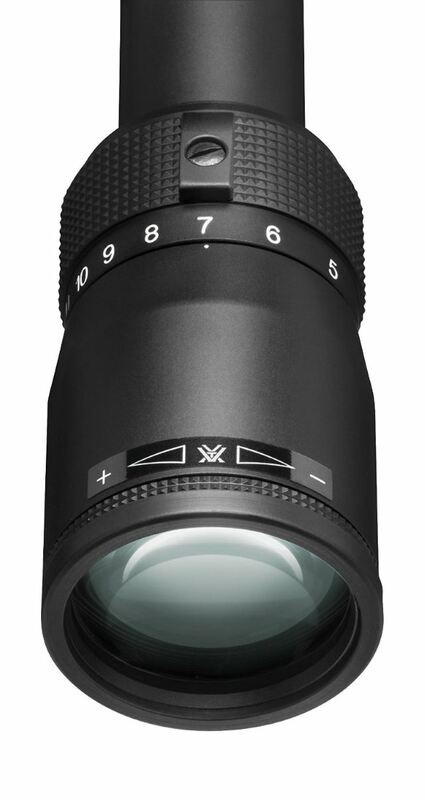 The manufacturer employs premium extra-low dispersion glass for the scope’s lenses to enhance resolution and color quality. Proprietary multi-coating is applied to these lenses to minimize light reflection on air-to-glass boundaries, for boosted light transmission. Both these features, along with 50mm objective lens diameter, result in excellent image quality and clarity, even in dimly lit conditions, and over the entire 4 to 24x magnification range. One of the most notable features of this scope is the tactically calibrated VMR-1 reticle that comes with it – this reticle is hash-marked for accurate long-range holds; moreover, besides the standard MOA reticle, you can also opt for MRAD variant. The only snag is that this is a second focal plane reticle so you’ll have to put in some extra effort every time you set up a new shot. Tactical adjustment controls, with fiber optic turret rotation indicators, streamline the adjustment process and make it incredibly easy to view the changes you’re making, in the field. A Customizable Rotation Stop mechanism lets you set up a zero reference which you can rapidly return to, after having adjusted the elevation temporarily for a shot. A side-focus adjustment knob allows for parallax removal from 50 yards to infinity. Structural integrity and reliability is ensured because of the scope’s 30mm aluminum single-piece main tube design, and it is, of course, both water- and fog-proof. A tough, scratch-resistant coating present on the outer lenses repels dirt, scratches and oil. Lastly, this scope happens to one of those few from the manufacturer whose fast focus eyepiece is largely free from eye clearance issues. Excellent image quality and clarity even in dim light. Tactical adjustment controls and CRS Zero stop make field adjustments intuitive, even enjoyable. VMR reticle allows for holdover and windage corrections, without cluttering your view. A bit pricey for its second focal plane reticle. This super affordable rifle scope is a testament to the manufacturer’s commitment to quality throughout their entire product range. Built around a sturdy aluminum single-piece 1’’ tube, the Diamondback is extremely durable while remaining lightweight. The air-to-glass boundaries on its lenses have multiple coatings of anti-reflective material to improve light transmission, which is further enhanced by the single-piece construction. The scope has 4x to 12x zoom range with a 40mm objective lens making it suitable for low-to-mid range encounters, but given this is a budget scope, you should expect some problems with image quality in low-light conditions at higher magnifications or greater distances. O-ring sealing and argon gas purging makes the product waterproof and shockproof, and a hard anodized matte finish minimizes reflection from the body that could reveal your position at a critical time. The scope’s precision glide erector system yields a highly smooth magnification adjustment, even under tough field conditions. The windage and elevation adjustment controls are pretty standard fare, but the good thing is that they hold their settings nicely under recoil. You can get the scope in two reticle variants: Dead-Hold BDC, which allows for bullet drop compensation, and V-Plex, which is more suited to traditional hunters. Obviously, the reticle lies in the second focal plane, which means you’ll have to recalculate subtensions for magnification levels other than the one it has been calibrated at. The fast focus eyepiece lets you focus on the target pretty well, but it’s a bit unforgiving in the eye relief department so I’d advise you to use it only with low-to-moderate recoil weapons. You may also experience some issues with sun glare. This scope may come with a couple of nagging issues, but that is to be expected at a price this cheap – however, it’s a good choice for an amateur shooter taking their first step into ranged rifle optics in that it is functional and reliably built; do not expect miracles from it though. Adjustment controls hold zero nicely. So-so image quality in dim light. Another offering from Vortex that packs a lot of bang for the buck, this Crossfire II scope is geared towards professional hunters on a low budget. It provides crystal clear pictures, even at maximum zoom, thanks to its multi-coated lenses, single piece tube construction and somewhat larger objective lens diameter. The 6 -18x44mm magnification and objective lens combination is effective even at moderately long ranges according to users, but of course, the low price means that it isn’t really the best choice for a long range marksman. Besides the capped adjustment turrets that allow you to set elevation and windage settings, the scope also has an Adjustable Objective that lets you adjust the parallax from 10 yards to infinity, so you don’t have to look for a ‘sweet spot’ to get your shots on target. In addition to the Dead-Hold BDC reticle that lets you make windage and holdover corrections, you can also choose variants with a more traditional V-Plex reticle, or an illuminated V-Brite reticle. For the BDC reticle, you should know that it is a second focal plane one, so the subtensions are set for max magnification by default. As far as ruggedness goes, the 1’’ one-piece tube made out of aircraft grade aluminum, the O-ring seals for waterproofing, and Nitrogen gas purging for fog-proofing, come together to create a very high quality product for the price. While this scope’s fast focus eye piece may be a bit better in terms of eye relief as compared to the Diamondback I’ve reviewed above, a few users have still complained about its inadequacy with their rifle setups. There have also been some complaints pertaining to damaged or malfunctioning products, but this is probably a consequence of the scope being manufactured in China. I’d recommend that you test this product thoroughly after getting it to discover any flaws in its workmanship – remember that you can always avail the excellent warranty policy Vortex offers to get a replacement! Excellent performance even at somewhat long range. Adjustable objective lens for parallax setting. Choose between dead-hold BDC, V-Plex and V-Brite reticles. Sturdy, lightweight 1’’ single-piece tube design. Some issues with eye relief. The Precision Shooting Tactical series has been created to cater to the needs of tactical long range shooters looking for thoroughly reliable, repeatable performance – and the PST 6-24x50 is the best this series has to offer. 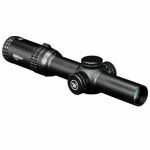 Utilizing the manufacturer’s signature single-piece aircraft grade aluminum main tube (30mm) design, this robust scope provides crisp, high fidelity imagery throughout the 6x to 24x magnification range, even in unforgiving lighting conditions. It achieves its superb visual clarity through the use of a hefty 50mm objective lens diameter and proprietary multi-coated lenses that maximize light transmission, as well as extra low dispersion glass that yields optimum image resolution and color quality. Aside from the EBR-1 reticle, you can also opt for a modified EBR-2C reticle; both allow you to capitalize on the crystal clear raw visual input, by easing windage, holdover and range compensations, so you can set up the perfect shot each time. These reticles also happen to be first focal plane, so you don’t have to concern yourself with subtension recalculations at all. Both types of reticles come in MOA and MRAD variants, and have an illumination feature to further enhance low-light targeting capabilities. You can adjust the illumination to your preferred level through an easily accessible side knob. All variants are etched and placed between two glass layers for maximum durability. Just like its HS-T cousin, the PST 6-24x50 FFP utilizes tactically designed, exposed adjustment turrets with serrated tops for optimal grip, as well clear outer markings to relay adjustment information to the operator in a far more natural manner than is the norm with regular adjustment controls. You will also find the CRS Zero Stop mechanism to be quite helpful for establishing a fixed zero to which you can reset back after having made temporary adjustments to the elevation. The scope allows you eliminate parallax through its side focus knob that is set up for 50 yards to infinity. Adjusting magnification is incredibly smooth, and the MAG-View Fiber Optic Bar indicates the exact magnification setting you’re at, without forcing you to abandon your line of sight. Standard features such as a waterproofing, fog-proofing and a fast focus eyepiece are all present, naturally. ArmorTek coating protects the outside lenses from scratches, dirt and oil. I did come across some complaints about somewhat unsatisfactory eye relief: frankly, this is a bit disappointing in a scope this expensive, but that’s about the only technical issue it has. Uncompromisingly high quality visual output in all lighting conditions. Zoom range, objective lens diameter and reticle optimized for tactical long-range shots. Choose between EBR-1 and EBR-2C illuminated reticles, both with their own MRAD and MOA variants. Strategically designed adjustment turrets, and CRS mechanism. Some complaints about eye relief. The Viper 6.5-20x50 PA incorporates the same great image quality and rugged construction of its more advanced cousin, the PST, but does away with some its more sophisticated characteristics to make it more affordable. As such, it seems geared towards hunters and competition shooters who want a fully functional medium to long range scope that won’t break their wallet. 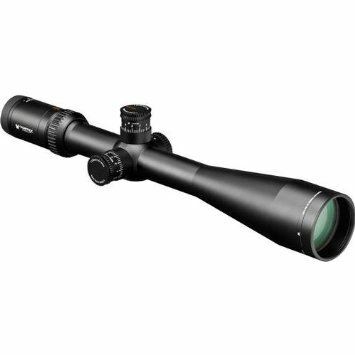 Like the PST, this scope also employs XD extra low dispersion glass for its lenses to output the crispest, most vivid target picture. Multiple premium anti-reflective material coatings on air-to-glass contact surfaces enhance the image even further by preventing light from bouncing off. The 50mm objective lens diameter, for its part, ensures that as much light enters the objective lens as possible. Apart from the BDC reticle, you’ve also got the option to go for a V-Plex reticle or a mil-dot reticle, so whether you’re a traditional hunter or a tactical marksman, you’ve got plenty of choice. You should know that this scope has a second focal plane reticle, so you have to recalculate subtensions when you change to a magnification other than the default one (varies with reticle type). 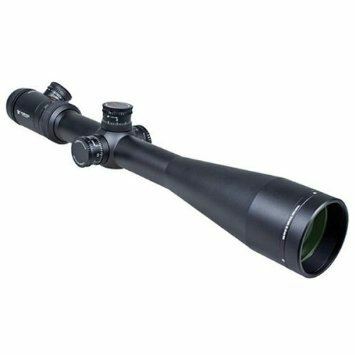 As expected, this scope also utilizes a 30mm single-piece main tube body made out of a single block of aluminum to give it maximum structural strength and optimal alignment. Argon gas purging and O-ring seals make it waterproof and fog-proof as well. The outer lenses are protected from scratches, debris and oil, by Vortex’s tough ArmorTek coating. The adjustment controls on this scope aren’t as technical as the PST’s, however, they still allow for changes that are accurate, smooth, repeatable and audible. The capped reset turrets let you rapidly reset to zero after having sighted in a few times. Some users did find that the scope had trouble holding zero after a few shots had been fired – this has probably got something to do with the reduced tension of the spring system. A side-focus adjustment on the left of the scope’s body allows you to perfect your focus and eliminate parallax with ease. The Viper 6.5-20x PA’s magnification adjustment is smooth, and a MAG-Bar feature gives you feedback about the magnification setting without requiring head movement. The fast focus eyepiece lets you focus on the target with ease, but like so many other offerings from the manufacturer, it also suffers from the inadequate eye relief problem at higher magnifications. Vivid, crisp image quality, just like its more expensive cousins. Diverse magnification range and wide objective lens suitable for medium to long range engagements. Choice of 3 different reticle styles. Intuitive, dependable adjustment controls and quick reset turrets. Hopefully, having gone through this guide, you have discovered a manufacturer that offers products to match any rifle shooter’s tastes and requirements: professional or amateur, high budgeted or low budgeted, ranged or close quarters, old-school or tactical – they’ll cater to them all, with unbeatable quality backed by an equally unbeatable unlimited warranty. 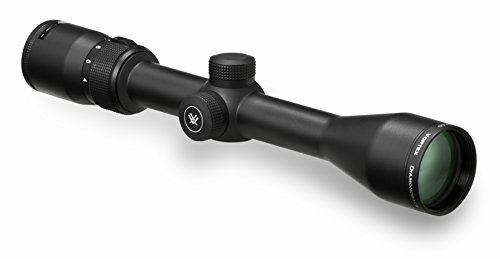 In my opinion, the Vortex Viper HS-T 6-24x50mm Riflescope w/ VMR-1 MOA Reticle is the best Vortex rifle scope, because it manages to pack a whole host of premium features such as superb optics, tactically designed adjustment controls and reticle choices, customizable zero stop mechanism, and a large single piece tube construction in a reasonably priced package. Plus, this scope doesn’t suffer from the low eye relief problem that seems to affect many other Vortex products. The second focal plane reticle is a bit of a turn-off, but it won’t be an issue once you’ve learned how to calculate subtensions on your own. Obviously, my opinion may not apply to you: Vortex’s lineup is so diverse that you may find another product that is far better suited to your needs. Spotting Scopes vs Binoculars – What Should You Use? Gungods.net is a participant in the Amazon Services LLC Associates Program, an affiliate advertising program designed to provide a means for sites to earn advertising fees by advertising and linking to Amazon.com.